You wake up with a throbbing head. You quickly discover that the door has been locked behind you. On the table, you find a notebook and an odd disk that was not there before. The lab seems to be filled with riddles. You will be able to escape only if you manage to solve all of the riddles in time. Otherwise, you will fall victim to this bizarre experiment with consequences you'd rather not even think about. Caution: Do not look at the playing materials (cards, book, etc). yet! First, read this manual together out loud and carefully follow all of its instructions. In addition, you will need something to write with (ideally pencils and an eraser), one or more sheets of paper, and a watch (ideally, a stopwatch) to keep track of the time. If you like, you can use a pair of scissors. The scissors will make the game easier, but won't be absolutely necessary. Get the book and the decoder disk ready on the table. Leave the "strange items" in the box for now. Sort the cards into three piles in accordance with what is written on their back sides: Riddle Cards, Answer Cards. Help Cards. Be sure not to look at the front sides of any of the cards yet. Check to be sure that the Riddle Cards and Answer Cards are arranged in ascending order according to their letters or numbers. Sort the Help Cards according to their symbols, and then place them on the side of the table. Place cards with the same symbol, one on top of another, such that the "1st CLUE" card is on top of the "2nd CLUE" card and the latter is on top of the "SOLUTION" card. Exception: For the symbol, there is only one help card. This game has no game board! You will have to figure out for yourselves what you have to find in the game and what the rooms look like. At the beginning of the game, you will have only the book and the decoder disk available to you. As the game continues, you will add the Riddle Cards - either to be found in illustrations, or referred to in the text. Whenever this happens, you can pick the corresponding cards from the Riddle Card pile and look at them. Likewise, you can only use the "strange items" in the box when explicitly told that you have found them. Until then , leave them untouched in the box! Example: If you find an illustration like this, you may immediately pull the corresponding Riddle Card out of the pile and look at it. 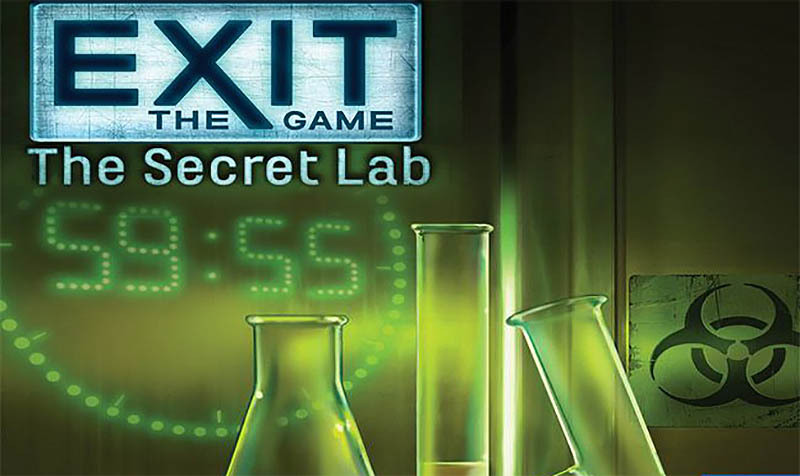 Your goal is to escape together from the secret laboratory as quickly as you can. That would definitely be easier if not for the fact that every lock in the room is secured with a riddle. During the course of the game, you will keep finding objects that are locked with a code consisting of three colored vessels. To access them, you will have to figure out the matching code and enter it into the decoder disk. At the edge of the disk, you will find 10 different symbols. Each symbol stands for a code to be cracked. But you will have to figure out for yourselves which symbol belongs to which code. Be sure to pay attention to every detail . If you think you can crack a code, enter it under the corresponding symbol on the disk. Then, look through the viewing window on the smallest wheel to see a number. This number indicates the number of the Answer Card that you are then allowed to look at. If the code is incorrect, you will have to keep searching for a solution or switch to another riddle for the time being. If the code is correct, the Answer Card will tell you how to continue. If so, the Answer Card will tell you. In that case, simply return the card to the pile and take another look at the riddle that you failed to solve. Maybe there's something that you overlooked. Or it may be that you simply don't yet have the hints that you need to solve it . Then you will just have to continue someplace else. Is The Code Possibly Correct? Where will you see the code symbol? Good question! To answer it, you will have to take a close look at the pictures in the book or on the Riddle Cards. All possible locked objects can be found in those places. All of these objects are marked with a symbol. Our example involves the bottle with the symbol on it. To continue with this example scenario: Next, take a look at the Answer Card pictured next to the bottle on the card. You will see that you should now retrieve Answer Card 18 from the pile. If so, the Answer Card will tell you how to continue. You will find one or more new Riddle Cards which you will be allowed to pull from the pile and look at immediately. Is the code actually incorrect? Well, in that case you must have made a mistake. You will just have to think about it some more and come up with a different answer. Whether right or wrong - return all Answer Cards to the Answer Card pile. All codes can be solved logically. You shouldn't just try all possible combinations on the disk. Of course, the game can provide you assistance if you get stuck. For each code, there are three Help Cards that can be identified by the symbol on their back sides. 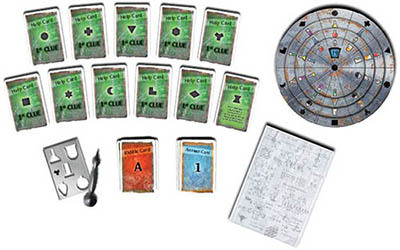 In addition to giving you an initial useful clue, each "1st CLUE" Help Card also tells you which Riddle Cards you must have found in order to be able to solve the corresponding riddle. The "2nd CLUE" Help Cards will give you somewhat more concrete assistance in finding a solution to the corresponding riddle. The "SOLUTION" Help Cards provide the solution to the riddle. IMPORTANT: Always take the Help Cards for a specific Riddle Card or riddle in the book. These riddles are usually identified with a symbol (matching a symbol on the decoder disk). It won't help you to use Help Cards if you have not found a riddle with the corresponding symbol. Have a little patience - some of the riddles can only be solved with the help of several Riddle Cards. You won't always have all of them available to you right away. Sometimes, you will first have to grapple with other riddles to get more cards. But don't be shy about using Help Cards if you get stuck. Once you have used a Help Card, place it on a discard pile. In addition to the materials contained in the box, you will need a pencil and paper for taking notes. You will also need a watch/stopwatch. 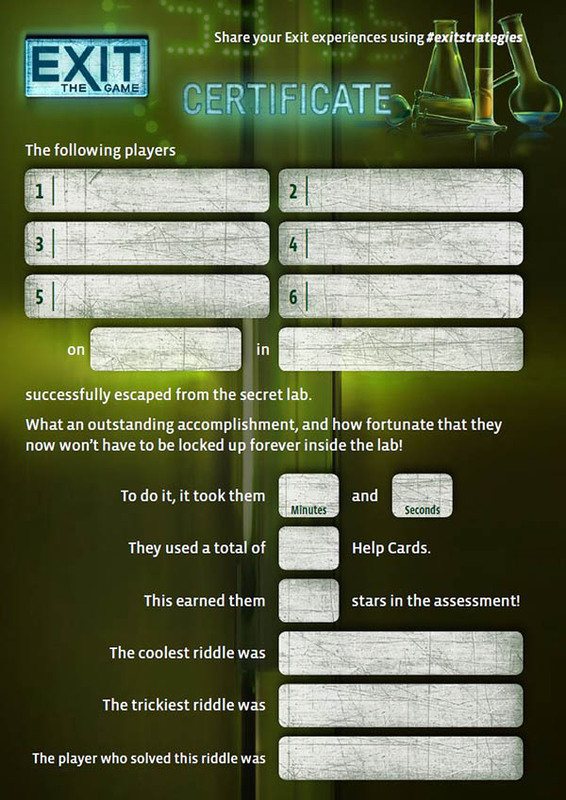 The game ends when you have solved the last riddle and escaped from the secret lab. A card will tell you that. Start a stopwatch (or check the time) at the beginning of the game so you know how long you needed. You can look at the table on the next page to see how well you did. When calculating the number of Help Cards used, of course, only the ones that gave you new hints or solutions should count. If a Help Card only had something that you knew already, do not include it in the calculation. Any game materials that you successfully used to help solve a riddle should be set aside, but not put away. You might need some materials again. But this way, you will be able to keep track of the materials more easily and won't get them mixed up. For several of the riddles, the only things that you will need are the illustrations of the rooms.